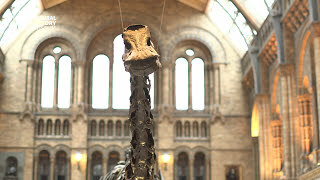 Dippy the Diplodocus skeleton has been installed in Dorset, the first stop of a UK-wide tour. Until now the dinosaur had never been on public display outside London. But visitors to Dorset County Museum will be able to see him until 7 May. After leaving Dorset, the skeleton will travel to seven other partner venues, ending the tour in Norwich in 2020. It is hoped that the iconic skeleton will encourage families and schools up and down the UK to explore nature on their doorstep. Each partner will use Dippy's visit to showcase their local nature and natural history collections, and the tour will draw attention to the rich array of past and present UK biodiversity. Director of the Dorset County Museum, Dr Jon Murden, says, 'We are so excited to be welcoming Dippy. As the birthplace of palaeontology, there is nowhere in the UK more appropriate for Dippy to start his tour than Dorset, and we're thrilled to have been chosen as the first host venue. The full skeleton in its displayed pose is 26 metres long, 4.3 metres wide and 4.17 metres high. Conservators have taken the past 12 months to prepare the delicate plaster-of-Paris cast for its journey. Harry Swift, 11, from Eastleigh in Hampshire, completed the installation of the Dippy cast alongside the Museum's Head of Conservation, Lorraine Cornish. Together they lowered the final bone into place, ready for the dinosaur's big unveiling. A diving blue whale skeleton replaced Dippy in the Museum's Hintze Hall in the summer of 2017. Sir Michael Dixon, Director of the Natural History Museum, says, 'Making iconic items accessible to as many people as possible is at the heart of what museums give to the nation. 'We wanted Dippy to visit unusual locations so he can draw in people who may not traditionally visit a museum, and we've made sure he will still be free to view at each stop on his tour. Dippy on Tour is in partnership with the Garfield Weston Foundation. Dippy’s tour will give people lots of opportunities to go on a natural history adventure, with activities for children to do at home or school, and local events. As we prepare to send the Diplodocus on a UK tour, we take a look back at his origins and time on display. What specimens have captivated visitors over the years as they enter the Museum?